We wish you a happy Gaudete Sunday. In this edition of the JRC Capital Management Weekly Outlook we present you the exchange rate of the British Pound to the US-dollar. It has been a turbulent year for the British Pound. This will not change by Theresa May’s win in the No-Confidence Vote in the Parliament. Even though she was able to win, a schism within the conservative party is more than obvious. Which makes the negotiations for the Brexit even more difficult. In contrast to that, the Greenback was able to gain in value. A fundamental reason for that was the G20 summit in Argentina, where the USA and China agreed on resting some tariffs and quotas. However, a possible inversion in the yield curve is causing fears among analysts. This phenomenon is has been a reliable indicator for a coming recession. The most important economic data of the 51st calendar week will be published towards the end of the week. On Wednesday, we await the British consumer price index, which is in the focus of the Bank of England due to increased prices after the Brexit vote. Furthermore, the Fed will announce its decision for the key interest rate. A raise by 25 basis points to a range of 2.25% – 2.50% is expected. Hence, it is already reflected by the price. The subsequent press conference by Jerome Powell could contain some important information regarding the Fed’s monetary policy. On Thursday, the Bank of England will publish the repo rate and on Friday, the gross domestic product and the durable goods orders will be published. It has been an up and down this week for the GBPUSD. Every new information regarding the No-Confidence Vote in the British Parliament caused moves in the exchange rate. Theresa May’s win in the No-Confidence Vote was able to support the Pound but not boost it sustainably. The pressure on the Pound remains high, so to see in the ADX indicator, which reflects the strength of a trend. If the price continues to fall, we can locate a support at the year of the low at 1.2478. Currently, the rate is moving at its lowest quotation since April 2017 and a break out below 1.2400 could cause more downward pressure. 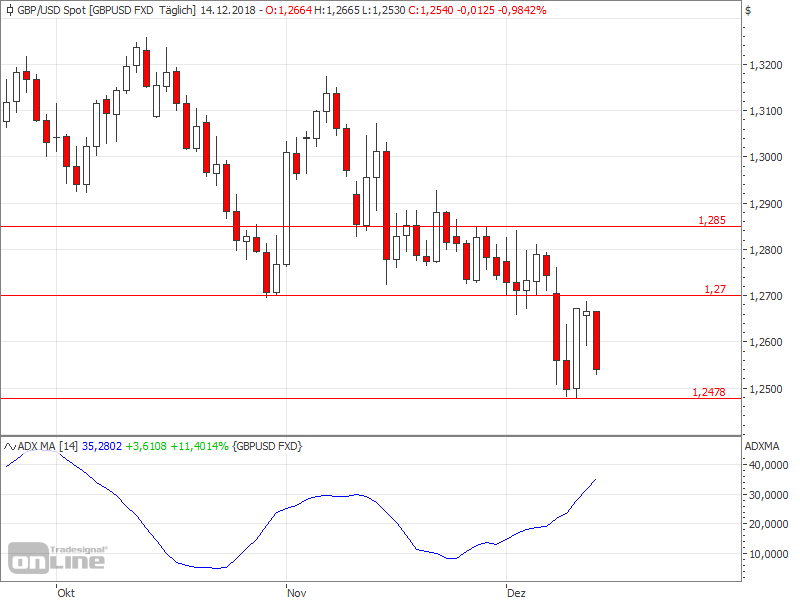 In case of a recovery for the Pound, the first important level is situated at 1.2700. This level served several times in the past as a support and resistance. At 1.2850 we can observe another important level. The GBPUSD oscillated and bounced off several times in this area.